Died out during the Cretaceous (chalk) period after 36O million years on earth. This specimen was found in a chalk stream on Windwhistle. The other exhibit shown is of a flint stone that was formed resting against a ammonite fossil. 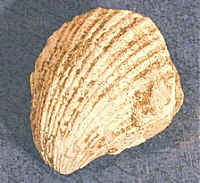 Other specimens, up to 40 cms, have been found in the chert and sandstones at the base of the chalk at some 600 feet average mean sea level. The only modem descendant is the rare tropical Pearly Nautilus. 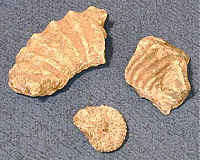 These specimens - probably Micraster coranguineum evolved during the Cretaceous Period - are scattered in the 'clay and flints' overlying the lower chalk. These specimens were found above 700 ft at Windwhistle and are fairly common. These specimens were dug out by badgers from the softer sandstone rocks at the base of the chert between the chalk and the upper greensand. These shells are abundant and vary in size from 1cm to a suspected 15cms, after badgers dug out a large broken section of a fossil. Again dug out by badgers from deep into the base of the chert. These show the remains of the mud digested by various worms and bivalves 100 million years ago. 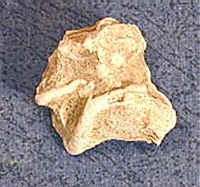 One of the features of the Cretaceous period is the amount of flint found. The top layer is 'clay with flints' which is the insoluble remains of the chalk after it has been leached out of the soil. 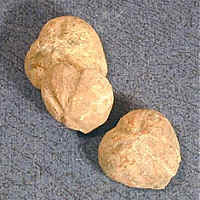 These form small irregular rounder stones, often broken, that scatter on the surface of a ploughed field. 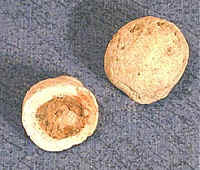 The specimens shown are a round flint stone that has formed around a later dissolved object. 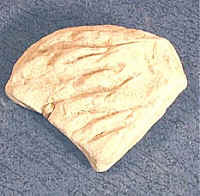 The result of splitting the stone are shown. These specimens are known as 'sheeps eyes'. 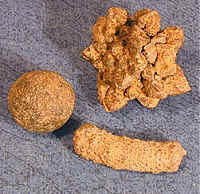 Small crystals can be seen inside. 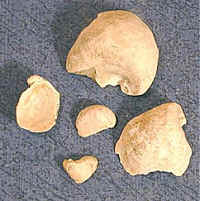 There is another type of flint. These form sheets of dark stone running horizontally deep in the chert. There is one such sheet, some 6 cms thick, in the steep bank below the farm buildings at Windwhistle. The chert here is over fifty feet thick with deep fissures making quarrying hazardous. Some of the gaps below flint are filled with calcite or silicate crystals. Found scattered in the 'clay and flints' overlying the chalk. These are probably marcasite - most are spherical, others are cylindrical and some are, rarely, found as crystals. The small lump of chalk shown bears the claws marks of badgers who dug it out from a hillside on Windwhistle. Although most of the chalk deposited as a solid mass, much is made up of small blocks (app 10 cms) with fissures were water has percolated.